The Central Ontario Developmental Riding Program (CODRP)/Pride Stables offers therapeutic horseback riding to people with disabilities. Classes are held during the fall, winter, spring and summer. Over 340 riders from Cambridge, Kitchener, Waterloo and surrounding areas, use the facility weekly, assisted by an incredible, large group of volunteers. During the summer months, Camp Pride, an 8 week integrated day camp, is in full operation with close to 200 children and many volunteers. During each lesson, riders learn the basics of riding a horse, depending on their abilities. The benefits of horseback riding are multidimensional. The instruction of lessons is based on sequencing, which enables each rider to learn at their own pace. Participating in weekly lessons also builds special friendships between the rider, their horse, volunteers and staff members. 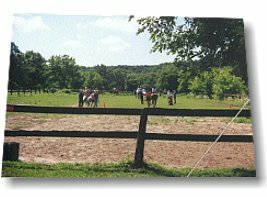 Therapeutic horseback riding uses the horse as a medium of therapy. The combination of the horse’s movement, which simulates the human walking motion, and its higher body temperature, serves to supply passive heat massage to the riders’ muscles, thereby either relaxing spastic muscles or stimulating lax muscles. Riders also participate in exercises improving their muscle strength and flexibility in their upper body. This program is managed by 2 full-time, and 3 part-time staff members, 3 instructors, a board of directors and over 350 volunteers, serving in a variety of capacities.